The Global IVD Quality Control Products Market size is projected to reach $1,052 million by 2022, registering a CAGR of 3.5% during the forecast period from $823 million in 2015. IVD quality controls are samples/materials used to validate the reliability of IVD testing system to ensure accuracy of test results and evaluate the impact of factors such as environmental conditions and operator’s performance on test results. This is attributed to upsurge in demand for third-party quality controls, increase in the number of accredited clinical laboratories, and stringent mandates from accreditation bodies & regulatory agencies regarding the use of controls. Poor reimbursement policies and stringent regulatory norms are expected to hamper the market growth during the analysis period. The global In Vitro Diagnostics quality controls market is segmented on the basis of product type, application, manufacturer type, end user, and region. Based on product type, the market is segmented into quality controls, IVD quality control data management software, and quality assurance services. The quality controls segment dominated the global market by product type in 2015, and is expected to maintain its dominance by 2022, registering the fastest CAGR of 3.7% during the forecast period. This is attributed to the upsurge in demand for quality controls to validate the accuracy, precision, and reliability of IVD test results. The end users of the market include hospitals, clinical laboratories, research & academic institutes, and others. The hospital segment dominated the IVD quality controls market in 2015, and is expected to maintain its dominance during the forecast period. Based on the manufacturer, the market is bifurcated into instrument manufacturer controls and independent manufacturer controls including third-party controls and instrument specific controls. The independent manufacturer controls segment accounted for the major share of the market in 2015, and is projected to grow at the fastest CAGR during the forecast period, owing to increase in demand for multianalyte and third party controls. The application areas of the in vitro diagnostics quality controls market include immunochemistry, clinical chemistry, hematology, molecular diagnostics, coagulation, microbiology, and others. The immunochemistry application segment dominated the global IVD quality controls market by application in 2015, and is estimated to maintain this dominance during the analysis period, owing to rise in demand for high-sensitivity immunochemistry tests, and increase in availability of multianalyte controls to validate the accuracy of immunoassay test menus. However, the molecular diagnostics segment is projected to grow at the fastest CAGR of 5.3% during the forecast period, owing to increase in the number of molecular diagnostic tests performed across the globe due to increased acceptance for personalized medicines. The global IVD quality control market is segmented into four regions, which include North America, Europe, Asia-Pacific, and LAMEA. The North America dominated the global IVD quality controls market in 2015, and is expected to continue its dominance during the forecast period, owing to increase in demand for technologically advanced multianalyte controls and stringent mandates for using controls. However, Asia-Pacific and LAMEA regions are estimated grow at significant CAGRs of 4.9% and 4.1%, respectively, during the forecast period due to growing number of accredited laboratories in the region and increasing volume of IVD tests performed in the region. In addition, countries such as China, India offer significant growth opportunities for market players due to upsurge in the number of hospitals and clinical pathologies, improvement in healthcare infrastructure, and rise in heath awareness. 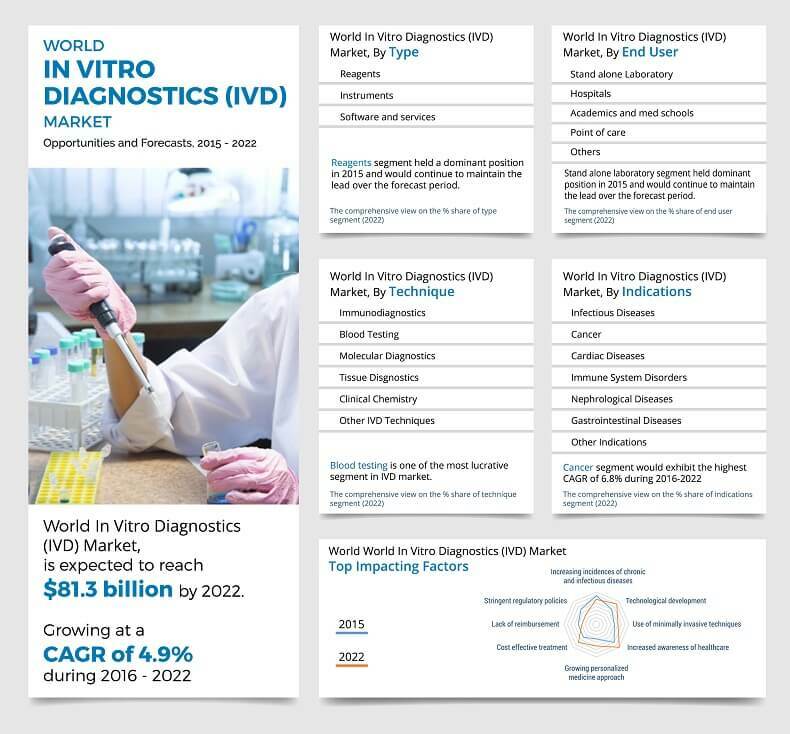 The key players profiled in the IVD quality controls market report are Bio-Rad Laboratories, Inc., Thermo Fisher Scientific, Inc., Randox Laboratories Ltd., Roche Diagnostics, Abbott Diagnostics, Helena Laboratories, Seracare Life Sciences, Inc., Technopath Clinical Diagnostics, and Sun Diagnostics, LLC. The other prominent players in the IVD quality controls industry (not profiled in the report) are Zeptometrix Corporation, ISOLAB GmbH, Sysmex Corporation, Fortress Diagnostics, Meril Life Sciences Pvt. Ltd., Multiplicom N.V., Future Diagnostics Solutions B.V., and Surmodics, Inc.
In-depth analysis of the IVD quality controls market is based on market estimations of key segments for the period of 2014&dash;2022. Comprehensive analysis of factors that drive and restrict the market growth of IVD quality controls industry is provided in the report. Exhaustive analysis of IVD quality controls industry market segments aids in understanding the prospects of IVD quality control products that are presently in use as well as with variants that would gain prominence in the future. Competitive intelligence of leading manufacturers and distributors helps in interpreting the competitive scenario of geographies. The profiles and strategies of key market players are thoroughly analyzed in the report to understand the competitive outlook of the market. 9.1. SERACARE LIFE SCIENCES, INC.
9.9. F. HOFFMANN-LA ROCHE LTD. In vitro diagnostics (IVD) quality controls (QC) are liquid or lyophilized samples or materials, which contain an established amount of analyte being tested. These controls are used in laboratories to ensure reliability and accuracy of test results in an in vitro setting. Quality control is used for monitoring the analytical performance of clinical laboratory testing processes. The IVD quality control products market is forecast to grow at a CAGR of 3.5% from 2016 to 2022. The market is driven by factors such as increase in the number of accredited laboratories across the globe, stringent mandates regarding the use of quality control products, and upsurge in the number of IVD test volumes across the globe. The IVD quality control materials are manufactured by both IVD product manufacturers and independent third party manufacturers. The IVD quality control products market is divided on the basis of manufacturer into instrument manufacturer controls and independent manufacturer controls. The independent manufacturer controls segment is forecast to grow at a significant CAGR during the analysis period, owing to increase in adoption of multianalyte third party controls. These multianalyte controls decrease the operating cost of laboratories involved in maintaining a wide range of quality controls for IVD instrument (analyzer) to validate their precision, accuracy, and reliability. 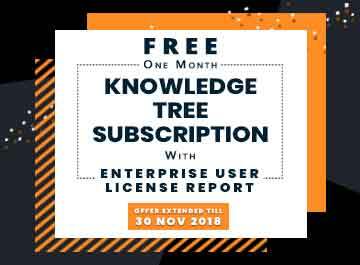 Moreover, long shelf life of third party controls enables the use of a single lot of controls rather than using multiple lots of reagents and calibrators. North America and Europe dominated the IVD quality control products market in 2015. However, emerging economies such as China, India, and Brazil are expected offer significant growth opportunities to key players in the IVD quality control products market during the high acceptance of third party quality controls, increase in the number of accredited laboratories, upsurge in volumes of IVD tests performed in the region, improvement in healthcare infrastructure, and rise in health awareness. Bio-Rad Laboratories, Thermo Fisher Scientific, and Randox Laboratories are the key players with significant shares in the global IVD quality control products market. "In Vitro Diagnostics (IVD) Quality Control Product Market"